So PunisherMAX ended recently. The Punisher is one of the few superhero comics characters that I actually care about, and so I have a certain amount of mourning for that. I realize that, as a superhero character, The Punisher can come back again and again, and that’s beautiful, but there is something about a run or a take on a character that has the feel of an utterance. This Punisher, different than any other Punisher, and yet still similar, somewhere at the core. I am actually traveling today, so I don’t have the time or ability to make a long post any long thoughts on the series (I have them, they will come one day). 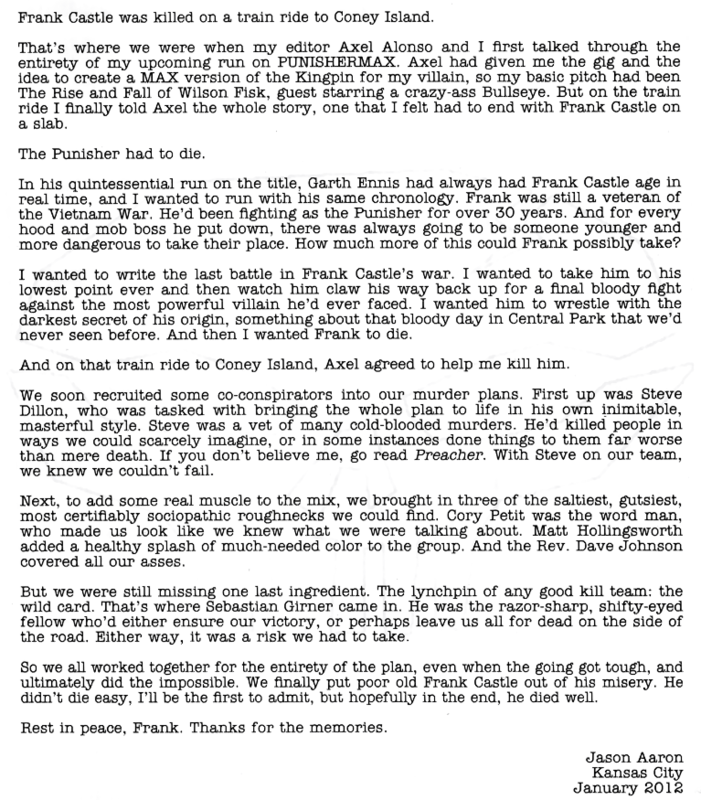 Instead, this is the last page of the series, a letter from Jason Aaron to the reader about Frank Castle. It’s a good read. There is something amazing to me about Aaron claiming that the death of Frank Castle happened during that train ride. For a fictional character, death comes at the moment that that death can be thought. We can then rehearse those deaths over and over again, tweak them so they fit an infinite number of storylines. Fictions, and comics particularly, could then be thought of as a space for best thinking through the deaths of all things–of ideologies, for example. It is like a supercharged speculative fiction space. In any case, I liked the letter, I hope you do too. This entry was posted in Comics and tagged jason aaron, the punisher. Bookmark the permalink.